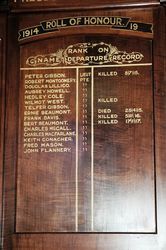 A wooden honour board commemorates those who served in World War One. It lists 15 names. 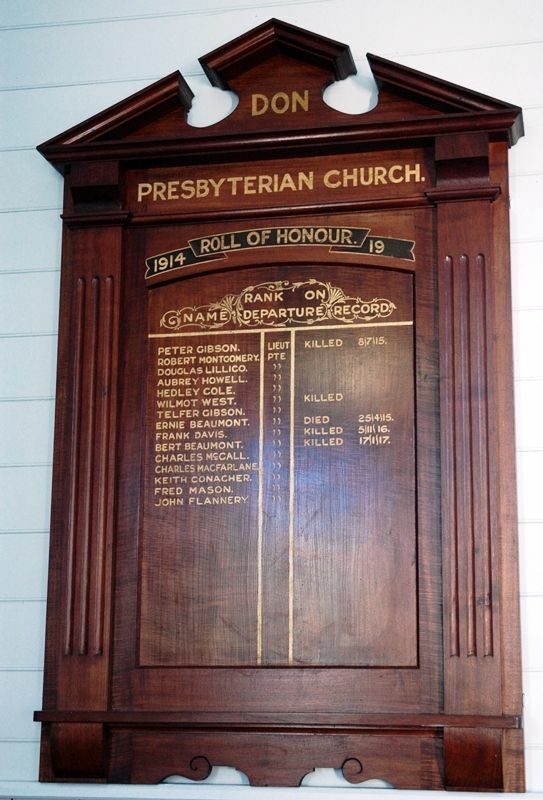 On Friday evening last a special service in connection with the unveiling of the church honour roll was held in the Don Presbyterian Church. The service was conducted by the Rev. J. H. M. Dabb B.A., who preached a most impressive and forceful sermon. The building was crowded, every available seat being occupied, friends being present from many of the surrounding districts. At the conclusion of the service the unveiling was carried out by Miss Nellie Gibson, whose brother, Lieut. Peter Gibson, has made the supreme sacrifice. 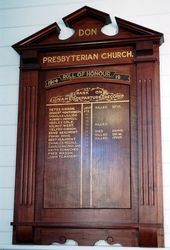 Out of the fifteen enrolled, all of whom were old Sunday school scholars, five have answered to the last roll call. The collection taken up at the close of the service will be given to the honour roll fund. Examiner (Launceston), 27th March 1918.